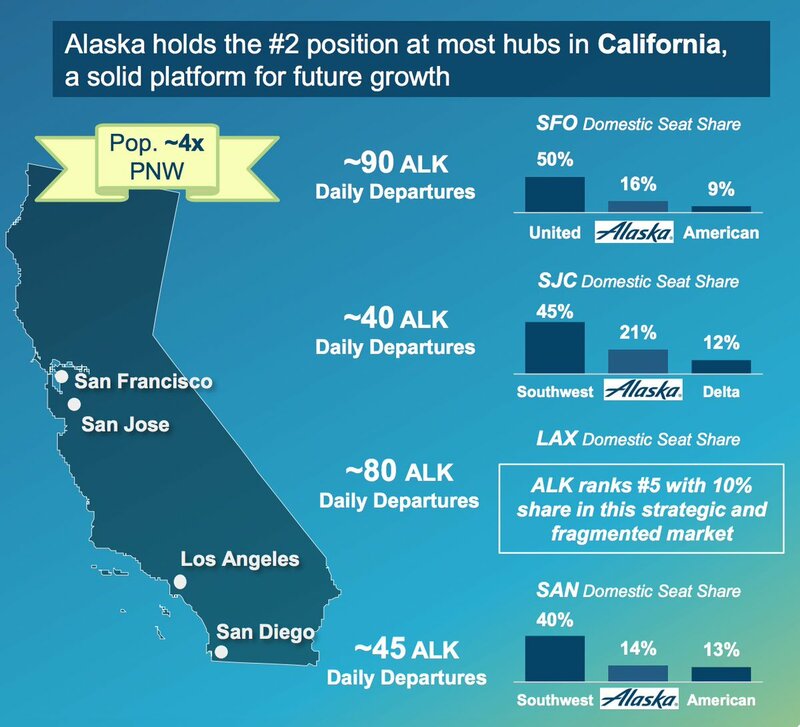 AS dominates in PNW and Alaska marketshare, but much weaker in CA against likes of UA and WN. Thanks for posting that. I miss your earnings threads. Hint hint. AS is going to have it rough when WN starts those Hawaii flights from SAN and SJC. They've already decreased some of their Hawaii flying out of SFO after UA's growth this year. Interesting that AS has nearly half as much of the seat share at SJC of WN. That looks pretty good to me. I wonder how the LFs compare? On the other hand, look at the disadvantage AS has versus UA at SFO. Much bigger hill to climb, unless the LFs are better. I didn’t listen to the call, but I think with the management reorganization coming that was previously announced I think these slides may be setting up an evolution of their Cali strategy. I read the transcript and honestly I don’t feel like they said much one way or the other about California. The pressure appeared to more be on HI performance. I went through the entire earnings call transcript. It sounds like the west coast yield pressure have leveled off a little bit. Maybe they've just dropped to natural level now given the capacity in the market. PNW sounds like doing well for them still. Yesterday, I took a look at yields out of a bunch of SEA market for Q2, AS looks to still have point of sale there vs Delta. At this point, AS just needs to keep adding capacity there. DL seems to be willing to loose a lot of money. It's interesting that they mentioned yield pressure on HI. That seems to match what I've been seeing in fares from LAX to HI. The fare are definitely down. Imo, they still got quite a few to go before reaching the transcon level. Just compare SAN/SJC to HNL vs JFK/BOS/MIA/BWI. That's where I think WN entrance will drop the prices. Except it wasn't a reorg; as part of reducing overhead, 100 FTEs were reduced from the management ranks, and while some were in the form of not backfilling some open positions, just under 70 were actual reductions in force. Those being RIF'd will be notified in the coming days, unfortunately. But to be clear, this wasn't a reorganization, a change of strategy, or anything like that. It was a painful, but necessary, reduction in force to reduce overhead a bit. FYI, this slide is not new; it first appeared during an AAG presentation in September. The title of the slide was: "Seven West Coast Cities Anchor Our Route Network Today." I would like to know what these totals on the slide were a year or two ago -- an indication of change or growth since. The slide admits that they are generally #2 in the CA cities -- nothing hard to believe about that. I don't see this as anything telling or pessimistic. What’s interesting is they chose total seats and not market share. Or ami misreading it? The objective is to be relevant in each major west coast hub/focus city served, increasing the utility to travelers on the west coast. Those are some good numbers for SAN and SJC. I figured that SEA would be significantly higher than PDX, though. Seems a bit odd there. Apart from probably not wanting to externally share MIDT data for fear of violating their MIDT subscription, MIDT wouldn't show WN unless it were internally adjusted, which you also wouldn't share externally. The only reason I mention these stats is that AAG is definitely growing in SAN and has been for several years. Judging by the a/c upgrades coming next spring -- 4 routes are seeing upgrades from EMJs to 'Buses and Boeings in March and April, plus freq increases are also happening. They also used Domestic seats only which makes their share look better in SEA and SFO. Since it's a percentage, the number is skewed by how much larger the SEA hub is over PDX. 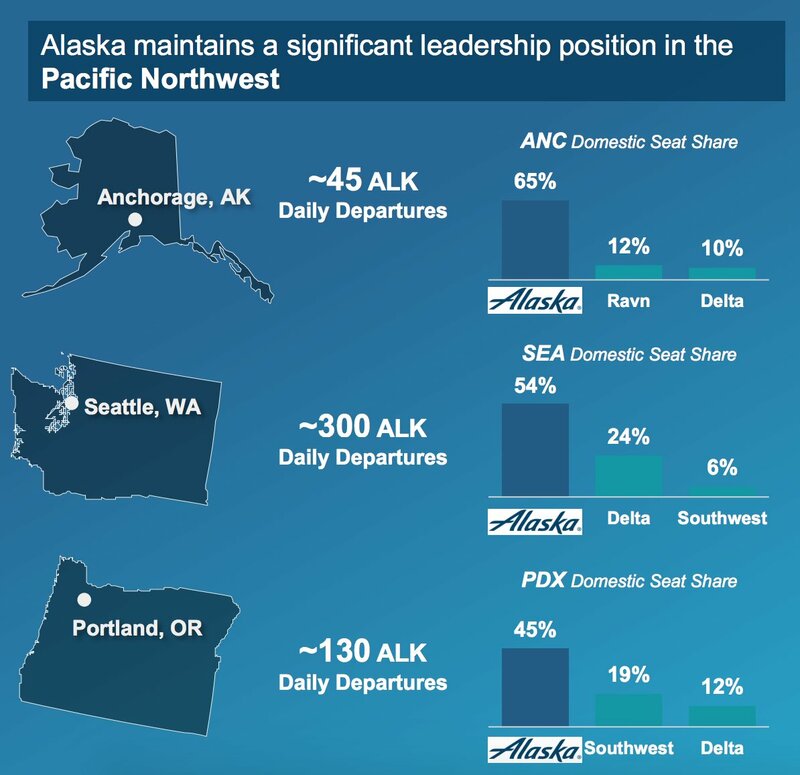 SEA could have several more additions than PDX and PDX would still show a larger percentage increase. There are shoes remaining to be dropped in the AS org chart. Just one. The first, Greg Mays, already occurred. Can you provide the number of passengers carried by AS and WN in these y-o-y comparisons? Thank you. The top domestic destinations traveled to out of PDX that AS doesn't currently serve nonstop from PDX include DEN, FLL, IND, BNA, MSY, RDU, TPA, and IAD. AS could add nonstop service to DEN, FLL, IND, BNA, MSY, RDU, TPA, and IAD out of PDX. I think that AS is likely to announce new nonstop domestic routes out of PDX either late this year or sometime next year, and I think that AS is also likely to add at least PDX-IND, PDX-BNA, PDX-MSY, PDX-RDU, and PDX-TPA nonstop service in the near future. Sorry for the delayed answer but I just now saw your post. No, I can't provide the pax counts for the 2 cx (or any) as SDIA doesn't provide exact pax totals by carrier. I keep "approximate" counts, as provided in the monthly stats at SAN but these are based on terminal areas and those numbers mix cx -- especially now that WN flies in and out of both T1E and T1W, and AAG flies in and out of both T1W and T2E!